Le Club AccorHotels has launched a triple points campaign for stays in South America during the year end holiday season. Members that book between September 22 – October 22, 2016, for a stay December 23 – January 8, 2017, can earn triple points for their stay. The only downside of this offer is that you need to make the bookings over the 30 day period starting from September 22. Remember to confirm that your promo registration is successful. 1. The terms and general conditions of Le Club Accorhotels apply to the offer Anticipate your reservation for the end of the year and earn discounts and 3x points! and you need to be a member of Le Club Accorhotels to benefit from it. 2. This offer allows members of Le Club Accorhotels, regardless of their status, earn bonus points x3 for a stay in one of the participants in the loyalty program Le Club Accorhotels hotels. This promotion does not apply to employees of Le Club Accorhotels hotels. The number of bonus points this offer is calculated according to the points earned by the member based on the status Classic. 3. This offer is average for a stay of 23.12.2016 until 08.01.2017 in one of the participating hotels, you have been booked between 22.09.2016 and 10.22.2016. 4. The stay has to be a minimum of 1 night (s). 5. Consecutive stays (check-out and check-in the same day) in the same hotel stays are considered simple. This simple stay will be eligible only once in the offer Anticipate your reservation for the end of the year and earn discounts and 3x points !. 6. In the context of this offer, it is considered one (1) stay every reserve one or more rooms at a participating hotel by a Member of Le Club Accorhotels. To avoid any doubt, if a reserve more than one room is made shall be considered as one (1) unique stay. 7. To benefit from this offer, reservation must be made through the Accorhotels.com page, pages and applications participating brands and through reservation centers accorhotels. Other booking channels are not included in this offer. 8. You must enter your loyalty card number Le Club Accorhotels at the time of booking and present it at the reception when you check-in. 9. Le Club Accorhotels bonus points are credited to the member’s account 10 days after the end of the stay. 10. This offer can not be combined with other promotional offers or current benefits and does not apply to groups. If your stay meets the conditions of various offers, only the points of the most generous offer, ie will be credited, which allows you to earn more points. 11. Stays paid wholly or partly with points or with one or more vouchers Le Club Accorhotels not eligible for this offer and can not be counted as stays linked to this offer. 12. Offer subject to availability. The terms and conditions of sale apply to specific public rates of each hotel. 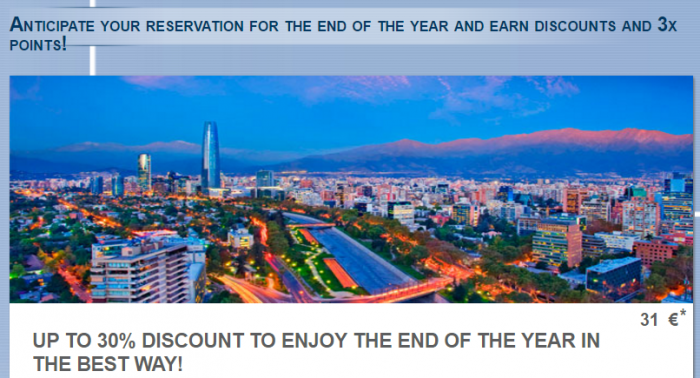 To enjoy the offer Anticipate your reservation for the end of the year and earn discounts and 3x points! You must sign it before booking.